With over 250 awards for product excellence, Briarpatch aims to capture and challenge your child’s growing mind. 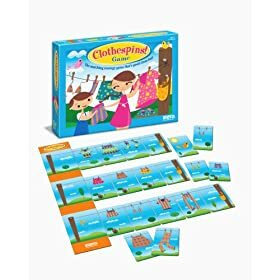 The game, “Clothespins” focuses on teaching children how to match using various criteria, from types of clothes to patterns. To play the game, a player must collect at least three matching laundry cards. They may be matched by style (example: all three laundry cards are boxer shorts) or by pattern (example: all stripes or all polka dots). Cards may be snatched away from your opponent by using a Bird card and in order to finish the game, the final card of each line must be the finishing pole. In the end, this game will rely completely on how the child reacts to the challenge put before them – they will both really take to the game and love it or they will become frustrated and the game will cease to be fun. If you do purchase the game, I would recommend playing with your child a few times, and if the understanding just is not there yet, put it away and wait for awhile. A simpler game for older children, a young one may find difficulty in place of entertainment.